We like Carl Kennedy here and have been big admirers of him, watching him grow with his own productions and DJ sets, nailing that Subliminal residency at Pacha Ibiza, as well as playing for the brand at many of their other events. Now, following on from his huge ‘Once Upon A Time’ track on Subliminal (a former Tune of the Day), this is the first release on his own label, Wasted Youth. 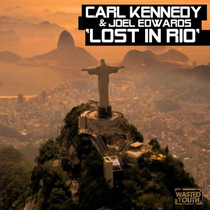 What you have is a big, emotionally charged house/electro anthem as Carl ups the production into main room territory, capturing Joel Edwards’ vocals perfectly as the track tells the story of a missing love and the desire to see a person you care so much for. It’s powerful stuff and although initially feeling quite poppy, after a few times of playing, the sadness and the depth of feeling in the vocals are hard to resist. If you recognise Joel’s vocals, it will be from his earlier work with pop/dance outfit Deepest Blue. With remixes from Sydney’s The Other Guys, the UK’s Adam Burn and Sweden’s Oskar, there should be one to suit everyone. We prefer the original for the song and the madness of Adam Burn’s remix for the floor. It’s probably out now, check it out below. Nice song, hot potential. Check us out & let us know if we can help promote your music.